It all began as a simple quest to lose a few pounds to go to the beach in two weeks. I simply cut my meals in half and exercised a bit more and, viola, weight loss. I felt the sense of power. After my beach trip I remained on my "diet" and continued to lose weight. I became leaner and thinner. Others began to notice my new body. As the illness progressed, I slowly began to fear food, thinking that anything that I put in my mouth would make me fat. My eating virtually ceased, my skin was dry, hair was falling out, I was weak, and began passing out. The closest people to me, my parents, were blind to my illness. Finally, a friend confronted me. I was in dismay and denied all accusations. I was scared to death that she knew, but I was also grateful that someone aware of my situation. I knew I had a problem, but did not know how to overcome it. Sure, in my mind I did, but defeating such a condition is not as easy as it may seem. It wasn't until she called my parents that I made the inner decision to make a change, as I didn't want to be sent away to a clinic or hospital. I went to the gym to gain the right weight the right way. Since I was underweight, the muscle gains came quickly and easily. Others in the gym began noticing my drive and physical changes and took me under their wing, introducing me to more advanced training techniques. Then, it was suggested that I compete in a bodybuilding contest. Now, I must admit that I admired the muscle goddesses that ruled the competitive stage on ESPN's female bodybuilding, but I never thought I had it in me to get in such condition. I always said that I would never do such a thing, simply because I didn't think I could. It was suggested that I get an idea of what female bodybuilding was all about so I went to a local competition. From that moment on, I was addicted and wanted to be a part of the competitive sport of bodybuilding. When I returned home from the contest with a quest to compete and I began my training. I had no idea where to begin or what to do. I failed my first attempt because I had no guidance or direction, but when I was told that I would never make it, oh, well that just fueled the fire. I was on a quest to Do It! 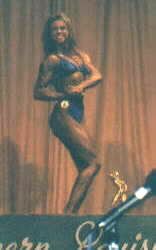 In 1995 I competed in my first bodybuilding competition, placing 4th in the Women's Novice Light Weight. I did well for training myself, but I wanted a higher placing. I competed two more times that season, placing 3rd in each competition. I realized that I needed to add more muscle in order to place higher. I trained hard for the next season. I was sure to eat a small, complete meal every three hours and not to over train. I competed again in 1996 and received a 2nd, 3rd, and 4th place in various shows. However, I still was not satisfied. I wanted first place. I began my off-season training for the coming year. I dropped my training back to three days a week and cut out a lot of the processed food items. As the show approached I started my pre-contest training. I started a 2-day on, 1-day off training split and began moderate cardio, which progressed weekly. I introduced carb-rotation and added more fat to my diet. I was seeing changes weekly, which kept the motivation in high gear. In 1997 I won 1st Place in the Women's Open Light Weight Division, and Overall! Finally, I got what I was working for, and it was well worth the small sacrifices. After that contest I had some major life changes. I was laid off my job and I moved to another state. After I got settled I started my online business, The Elite Physique, (MsFit) where I write eBooks, newsletters, and articles on how to accomplish what I did in my fitness and bodybuilding era. Now that I got a lot of complications out of the way, I am preparing to compete again. My goal is to have fun and be in the best shape rather than trying to win.